Less Than Reality: Hanson Is Coming Out With a Beer - MMMHop! Isaac, Taylor and Zac Hanson, now several years away from their smash hit MMMBop and their childhood in the spotlight, are entering a new market...and this one's alcoholic. The Hanson brothers, formerly known for their bubblegum pop music and being mistaken for girls, have decided to create an IPA beer for their now over-21 fans. The IPA, which will hit the market in 2012, will be called MMMHop. If you were a pre-teen or something like it in the 90's, you get the reference. The fact that Hanson's coming out with a beer is surprising, and also surprising is the fact that they're willing to reference their first hit single in the name. I feel like they've come such a long way from being the MMMBop band. Now they are involved with charitable work, have toured with their much more grown-up music and have even branched out into non-Hanson-family ventures, like Taylor Hanson being a part of Tinted Windows. To be fair, though, calling the beer MMMHop will garner lots of media attention that it wouldn't get if it wasn't equated with Hanson. And, the guys say that it's all part of their Hanson brand building. I wonder if the fact the beer is Hanson branded will help or hurt its sales. I'm sure Hanson fans will buy it because it's a Hanson beer, but will those who were appalled by MMMBop and I'll Be With You In Your Dreams be willing to take the plunge into a Hanson-branded product? Will grown men be embarrassed to drink the brew even if it's good? I guess only time will tell. I can tell you this - I can't stand beer and I'll definitely be giving MMMHop a try. 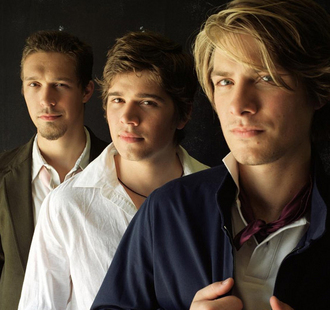 Just a note in case any Hanson PR people read this: I'm a Hanson fan! I'd love to try the new beer and review it for the blog. I'll also have people who really like beer try it so we can all offer opinions. :) Email lessthanrealityblog@gmail.com.